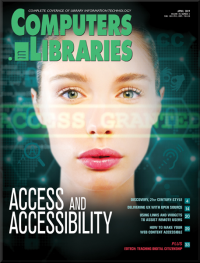 Computers in Libraries is a monthly magazine that provides complete coverage of the news and issues in the rapidly evolving field of library information technology. Focusing on the practical application of technology in community, school, academic, and special libraries, CIL includes discussions of the impact of emerging computer technologies on library systems and services, and on the library community itself. We now welcome readers of Internet@Schools magazine, and we will feature an ed-tech topic in each issue.